Die Walküre is the second in Wagner’s four opera Ring cycle and includes the well-known excerpt, the "Ride of the Valkyries". The cycle of four operas which comprise the Ring is the largest single recording project ever undertaken in Australia. The recording of the Ring Cycle would not have been possible without the support of the Australian Government. In May 2004, the Federal Government awarded a grant of $5 million over five years to the Melba Foundation for the production of high-quality music recordings to showcase Australian artists on the world classical music stage. Brilliant young Israeli conductor Asher Fisch conducts the Adelaide Symphony Orchestra and singers Lisa Gasteen, who is cast as Brünnhilde, Stuart Skelton as Siegmund, John Wegner as Alberich, Richard Greager as Mime, Deborah Riedel as Sieglinde and Jonathan Summers as Gunther.The recording involved 65 microphones recording 60 hours of performances at the Adelaide Festival Centre. The production itself was massive, involving 129 orchestral players, 70 chorus members, 27 principal singers – all but three of them Australian – and a backstage crew of 75. Die Walküre is a debate between love and law, between spontaneity of feeling and social convention, between the heart and the head. As you might expect from such a story, there is not so much stage action in this opera, less in fact than in the other three Ring dramas. It’s true that the director has to achieve some big coups de théâtre – the door of Hunding’s hut flying open, the Siegmund / Hunding fight, the magic fire around Brünnhilde, perhaps even some flying on horseback during the all-famous Ride of the Valkyries. But he also has to put onstage lengthy storytelling by Siegmund, Sieglinde and Wotan, and two substantial arguments between Wotan and his wife and daughter – much of it about events that spectators have either seen or heard about before. 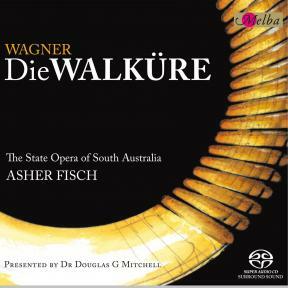 Yet from the moment the first Ring was given in the composer’s own custom-built theatre in 1876, Die Walküre has been the most popular by far of the cycle’s four operas. The reasons for that popularity have much to do with the story’s naked emotionalism. Nietzsche called Wagner ‘the Orpheus of private misery’. He was thinking of moments like the lonely dilemmas of Wotan and the Wälsung twins (the first human beings to appear in the Ring) which are given such musical prominence in this opera. The libretto also fits the pattern of the classic (and sentimental) mid-Victorian escape story of love in flight, love thwarted by well-meaning parents and some hope at an essentially sad end. Also, Die Walküre was the last and most sophisticated of the four Ring texts to be written and the one in which Wagner felt able to be most free with his source material. (While Das Rheingold and Siegfried are fairly literally taken over from the narratives of Icelandic mythology, Die Walküre may be called, in film terms, a ‘treatment’ of those sources, with their huge spans of time and genealogy cunningly compressed.) In short, Wagner mixed together ancient mythology and contemporary politics and philosophy with an emotional charge derived from his personal life and beliefs – a process more akin to the work of novelists like Flaubert or of playwrights like Ibsen than to manufacturing a conventional opera libretto. The extra emotional charge of Die Walküre is explained by its being created during one of the most traumatic periods of Wagner’s life. An exile in Zurich after his role in the abortive Dresden revolution of 1848/49, the composer was on the make intellectually, socially and (at least in his head) sexually. He began to enjoy the salon admiration (the modern word is groupiedom) for which he despised Meyerbeer, Mendelssohn, and even his artistic blood brother Liszt. His marriage to Minna Planer was a dead letter (‘In my soul I am a stranger to her’, he wrote in 1851). He sought attractive, intellectual company, preferably rich. After some meetings with Johanna Spyri (the future writer of Heidi), he found all three in Mathilde Wesendonck, whose husband Otto (partner in a New York silk firm) became his chief financial benefactor before King Ludwig. As Mathilde was comfortably, if rather eccentrically, married, she was also attractively inaccessible. After the singer Wilhelmine Schroeder-Devrient, she became Wagner’s second great muse. They first met in 1852. Soon Wagner wrote to Liszt about one of his musical promotions in Zurich, ‘I laid the entire festival at the feet of one beautiful woman’. Because she wrote poems which Wagner composed (the ‘Wesendonck Lieder’) while working on Tristan, Mathilde has often been associated with that work alone. But she was Sieglinde before she was Isolde, no less an inspiration to Die Walküre than to Tristan, an influence deliberately courted by Wagner to help him create the atmosphere of his new work. Fantasising about a relationship with Mathilde helped the Act I love music to be written down at delirious speeds. Cryptic notes (in initials only) are inscribed in the composition sketches about Wagner’s private dreams about her: ‘Were it not for you, beloved …’ above the passage where Siegmund gazes into Sieglinde’s eyes as he tells the first part of his life story, and ‘Beloved, why have you forsaken me?’ when Siegmund is apparently left alone for the night in Hunding’s hut. While planning the Ring Wagner had written copiously – but words, not music. Playing on 19th century Europe’s obsession with the legend of the suffering artist, he publicised both his life’s work, and his work’s life, like a politician tweaking a press release to make his government sound wise before the event. His personal history was rewritten to make his earlier operas seem to fit a long-planned creative timetable. Der Fliegende Hollander, Tannhäuser and Lohengrin were redesignated a trilogy about the progressive artist outsider misunderstood by blinkered, conventional society. It was a logical step further in Die Walküre for his current emotional life to figure in his librettos – or, like those notes to Mathilde, for his emotional life to be made to mirror that of his opera’s characters. ‘That was rather well-timed’, Wagner noted when a complaining letter from his wife Minna arrived in the middle of work on the Act II Wotan / Fricka scene. Minna had become Fricka the scold, the goddess consort who, in Das Rheingold, wanted all that Wotan could gain from the world, but, in Die Walküre, wanted her man to stay at home, abiding by the old laws he had created. In the same way Minna had wanted Wagner to keep writing showy grand operas in the style of Rienzi and toe the party line as a salaried Royal Kapellmeister in Dresden. I find the subject of Die Walküre too painful by far. There’s really not one of the world’s sorrows that the work does not express, and in the most painful form. Playing artistic games with pain is taking its revenge on me…. I’m now on the second Act, in the scene where Brünnhilde appears to Siegmund to foretell his death: something like that cannot be called composing any more! There is another factor which accounts for the strong emotional pull of Die Walküre in performance. Wagner’s major literary heroes – and few 19th century composers maintained such a large library or read so voraciously - were Shakespeare, Homer and the Greek dramatists of antiquity. Their influence is in all his work but the central relationship of Die Walküre – that of Wotan and Brünnhilde – is especially touched by the family tragedies of Shakespeare’s King Lear and Sophocles’s Antigone. In the latter, the ruler Creon will not allow Polynices to be ritually buried because, according to the letter of the law, he had been in rebellion against Thebes – even though he only rebelled because his own brother had broken the law. Polynices’s sister Antigone, who is engaged to Creon’s son, disobeys Creon’s command, and is condemned by him to be walled up alive. In Wagner’s Norse sources Brynhild was put to sleep by the god Odin for killing a hero in battle she was meant to protect. Wagner had his Brünnhilde try to protect Siegmund. He then grafted on to that idea Creon’s dilemma over Antigone – the ruler compelled to punish his future daughter-in-law for an emotional act that was not a crime in spirit – making Brünnhilde’s fate a crucial part of his opera’s central theme of love versus law. The key relationship of Shakespeare’s King Lear – that between Lear and his banished daughter Cordelia – informed Wagner’s handling of the ‘private misery’ of Wotan and Brünnhilde. Lear’s ‘I am bound on a wheel of fire’ is echoed in Wotan’s ‘These are the fetters which have bound me / Since by my treaties I rule, by those treaties I am enslaved’. Both rulers have made foolish decisions and, as a result, seek to abdicate their power. Both have a favourite daughter, spurned by her own sisters, who (a little too late) touch their father’s hearts, making him realise the validity of their honest but controversial actions. It’s an intriguing coincidence that both Wagner and Verdi – often thought of as the chalk and cheese of operatic composers – were working at the same time in the 1850s on the father-daughter subject matter of King Lear and the conflict between the personal and public lives of a ruler. Wagner’s knowledge of Shakespeare and Sophocles helped to enrich the compelling emotional subject matter of his most popular Ring drama.